The V4000 package is one of our latest systems featuring the new Sam4s Titan 160 touchscreen terminal with its crisp design and true-flat LED display and the widely-used ICRTouch TouchPoint EPOS software. The package comes complete with a fast thermal receipt printer, a full size robust-build cash drawer and the confidence of a 3 year manufacturers warranty on the equipment. The included EPOS software is on a permanent licence, meaning there are no ongoing monthly or annual licence fees to ever pay. No cloud connection is required as the system is installed locally, making it fast in operation and 100% under your control - you are not reliant on any external website service for the operation of your business nor do you risk ever being disconnected. Once it is installed, the software will work permanently without any further licence payment ever being required. With the ICRTouch TouchPoint epos software, it is comprehensive in functions and flexibly offers a range of optional extras: you can add additional Remote Printers for printing kitchen tickets, it will support Tablet computers for use as Wireless Waiter Terminals (both Apple iOS and Android devices), a Royal Mail Address Database if you are running a food delivery business, and support for Telephone Caller ID to automatically retrieve records of existing customers and their previous orders. The true flat screen results in clear crisper picture contrast and brighter clearer colours. The Fanless processor provides near-silent operation. Stylish design with gloss finish. Inbuilt power supply and clever design resulting in tidier cable run. Choose Black/Grey or Black/White casing. 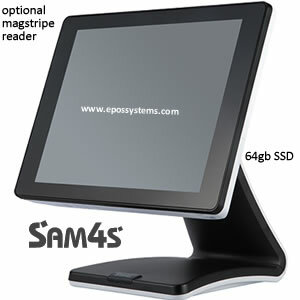 Each package from EposSystems.Com is supplied with a 15" touchscreen terminal, epos software, a fast thermal receipt printer and a secure cash drawer. % Discounts by transaction or by line item. The Package includes 3 year warranty on all equipment and 1 year FREE remote support subscription to provide support by phone, email and remote access (with internet connection) during office hours Monday-Friday. It is NOT necessary to have an internet connection or Back Office PC to operate the system. Everything required is included in the stand-alone package. If you do wish to have remote reporting, enhanced stock control and purchasing functions, then the optional Back Office software provides these features, either networked at the same premises or remotely from any where using an internet connection. for use with your own iOS/Android Device. 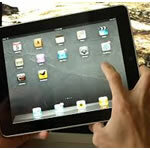 Compatible with Apple iPad, Samsung Galaxy Tab and similar tablet devices. You will require a good quality WiFi signal throughout your premises. We recommend using devices with a rugged waterproof casing and minimum 6" screen size. Interested in buying the V4000 package? Interested in this EPOS System? Friday 19-April-2019 23:14 Our office is currently closed. We will be open again from 10am tomorrow.